Yakisoba. Isn’t that just fun to say? It’s Japanese for fried noodles, and while I’ve never had the authentic version from the streets of Japan, I can see why it’s addictive. 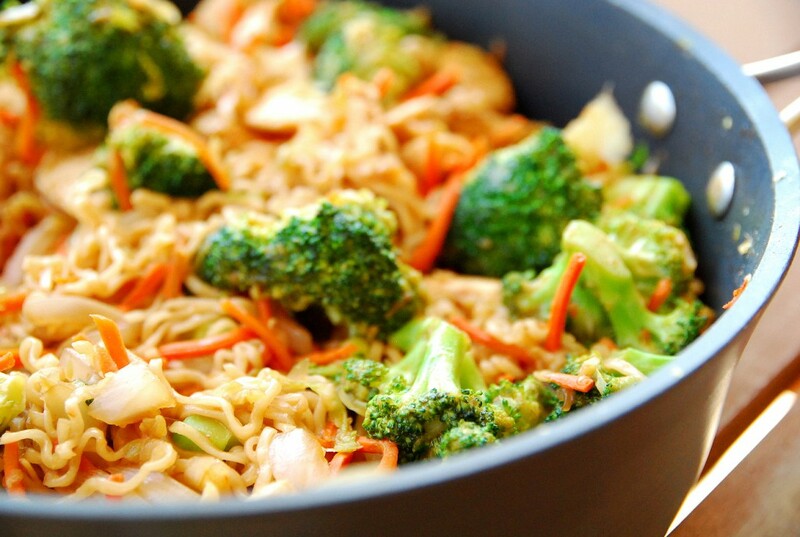 The noodles have great flavor and the chicken, broccoli, cabbage and carrots are scented with ginger as well as a bit of spice (You can take or leave the spice depending on your kiddos). I take some shortcuts to make this come together very quickly — pre-shredded cabbage (coleslaw), pre-shredded carrots and even pre-chopped broccoli (hey, I only have 20 minutes to get dinner made!) You don’t have to, but it sure does make it easy! Overall, this is a quick and easy stir-fry that my kids happen to love. p.s. The sriracha sauce is the spicy component in this dish. I have some wimpy kids, so I used less than a teaspoon. In a small bowl, combine the soy sauce, Worcestershire sauce, ketchup, sriracha, and sugar. Use only 1/2 tsp of sriracha if you don’t want it spicy, use up to 1 Tbsp if you like it hot. Stir until the ketchup and sugar are dissolved. Set aside. Prepare the meat and vegetables for stir frying. Peel the ginger and grate with a microplane or cheese grater. Slice the onion into thin strips. Cut the broccoli into bite-sized pieces. Slice the chicken into thin strips. Heat the peanut oil in a large skillet or wok over medium-high heat. When the oil is hot, add the grated ginger, saute for about 30 seconds to one minute (it's okay if it sticks to the pan but don’t let it burn). Add the chicken strips and cook until they are no longer pink (about five minutes). Once the chicken is cooked through, add all of the vegetables. Stir and cook until wilted (about 5-10 minutes). Meanwhile, once the water boils, add the noodles and cook just until tender (2-3 minutes). Drain, return to the pot (with the heat turned off) and toss with the sesame oil to keep from sticking. Pour the sauce into the skillet with the chicken and vegetables with the heat still on medium high. 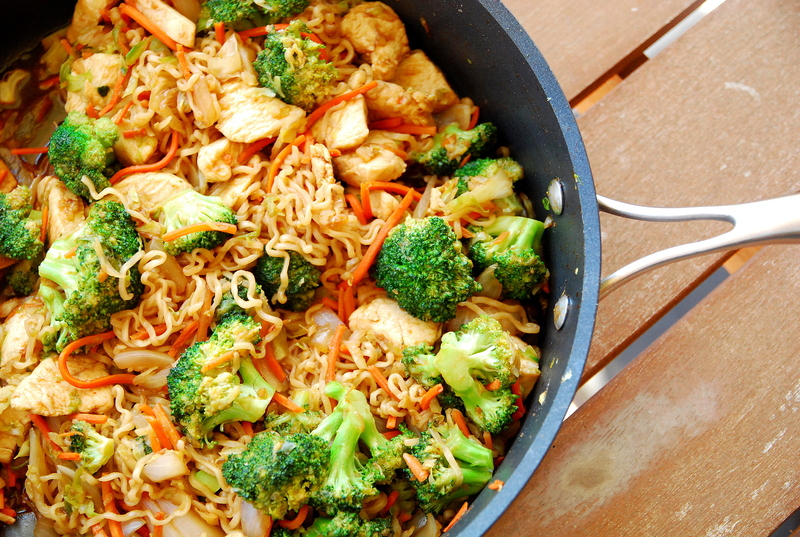 Add the noodles, stir to coat everything in the sauce, and heat through (just a few minutes).